ALCS Certificate Recipients – You Could Be Next! The Junior League of Kansas City, Missouri, in collaboration with the Midwest Center for Nonprofit Leadership at the University of Missouri-Kansas City would like to congratulate the inaugural class of Advanced Leadership Certification Series (ALCS) Graduates: Erika Bran, Azure Postell, Ashley Campbell, Kristal Ronnebaum, Lindsey Clancey Deann Salazar, Jaymi Cotter Jessica Todd, Jill Frasier, Theresa Uchytil-Etler, Cynthia Hinrichsen, and Caroline Wake. 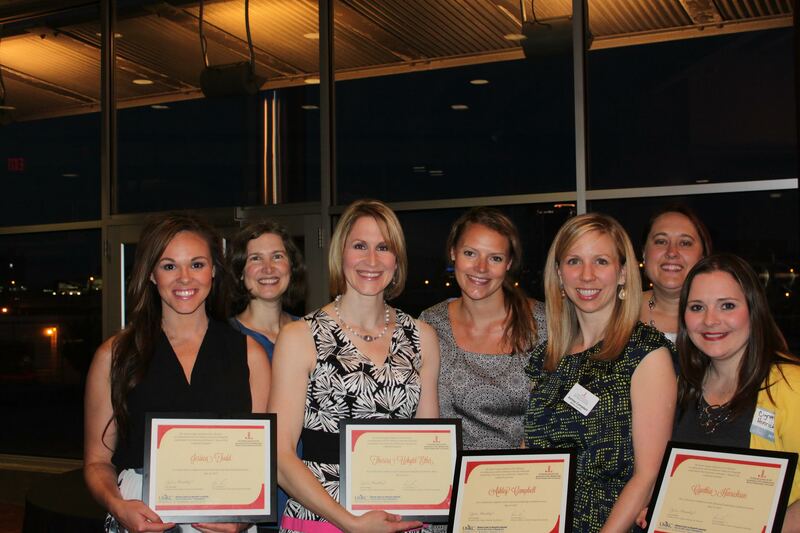 These distinguished Junior League members received their Advanced Leadership Certification Series certificates at the May 2015 General Membership Meeting upon completion of a series of 12 advanced leadership training modules they each attended over the course of the 2013-2014 and 2014-2015 League years. Above and beyond their membership requirements, these women took it upon themselves to spend 36 additional hours (3 hours/module) and supplement the fees paid by JLKC to UMKC by giving $360 ($30/module) out of their own pockets to receive this certification. Last year we talked about how the ALCS program was designed in partnership with the Junior League and the experts at the Midwest Center for Nonprofit Leadership at UMKC to provide a high quality, comprehensive and certified series of advanced leadership skills training sessions available to all Junior League members. More than 90 members attended at least one of the 24 ALCS modules offered over the course of the past two League years. Interested in participating in the ALCS program in the 2015-2016 League year? The Training Committee will be offering the first six ALCS modules throughout the course of the 2015-2016 League year. While it’s not necessary to have participated in ALCS in a previous year, if you have completed one or more of the modules in the past, those completed modules will count towards your ALCS certification if you so desire to graduate from this program. We hope you all take advantage of the wonderful advanced training opportunities available to you. Did you know that the League subsidizes this program to make it more affordable to members? JL members pay $30/ALCS class compared to approximately $125/class for a comparable 3-hour credit graduate course at UMKC. Membership does have its privileges! The following is a listing of the 12 modules offered in the ALCS program. The training committee looks forward to you attending one or more of these courses this year! This entry was posted on September 1, 2015 by JLKCMO in Training.